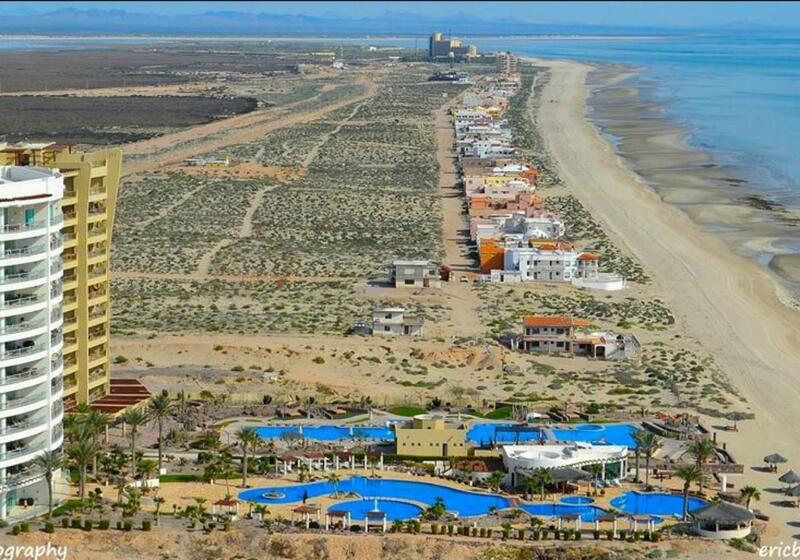 Playa La Jolla M1 Lot 6, Puerto Penasco/Rocky Point, Sonora, For Sale by Grant MacKenzie Sr.
Beachfront, Casa de la Paz in Playa La Jolla is a 4 bedroom / 3 bathroom spectacular home on a pristine beach with dynamic ocean views. The inviting courtyard is completely enclosed with palm trees, boveda entry and vintage pavers. The entry has a boveda ceiling and stained glass windows. You’ll love the expansive wall of windows with oceanfront views from the master bedroom, charming kitchen and dining area, large living room with a fireplace and boveda ceiling plus a great room. It has three entrances to the covered patio and uncovered patio running the length of the home. You step directly on your own beautiful beach or there’s a Jacuzzi for your enjoyment and even an outdoor shower. The charming kitchen has a wood beamed ceiling, custom beach tile, and woodwork, an expansive bar for dining, gas stove, butcher block island for the gourmet chef in your life, desk area and YES oceanfront views from every direction. It’s light, bright and fresh! Master bedroom is oceanfront with a boveda ceiling, sitting area, private entry to the patio and you’re surrounded with incredible ocean views. Master bathroom has a tropical motif, with custom tile. One guest bedroom has a beamed ceiling, cozy nook for meditation, vanity with mirror, sitting area for reading, and built-in cabinets and closets. The bathroom has an entry from the bedroom and from the hall with custom tile work throughout. The 2nd guest bedroom has 2 single beds, a nook for meditation or a fun play area for small children. There’s a Jack and Jill bathroom between the 2nd and 3rd guest bedrooms with more custom tile. The 3rd guest bedroom could be a wonderful yoga or work out room. It has a beamed ceiling and a built in sink with mirrors and cabinets. The laundry room is large with a sink and shelves. This beachfront home is turn key ready and offers everything a family could ask for or two families and friends. Please call us for your private tour. Shop – includes two work benches and a private entrance. Led “Xmas” style lighting above crown molding in master bedroom, entry, living room and in the enchanting hallway.